If you'd asked me six or seven years ago what was driving me artistically, I would have told you about my ongoing goal of performing the complete viola da gamba works of Marin Marais with my ensemble, the Marais Project (you can hear us play this repertoire on Youtube). As a viola da gambist I am a member of the second generation of the historically informed performance (HIP) movement, a fairly narrow but popular enough classical music byway. Given that my day-to-day focus is on the French baroque, and more specifically, French baroque viola da gamba music, it is fair to say that I occupy a niche within a niche! But happy as I was, I had a nagging feeling I wanted more. I was increasingly interested in jazz and came across a few You Tube clips of colleagues playing the electric viola da gamba. My interest was piqued. That 'more' I was looking for turned out to be the electric viola da gamba. In 2015 I formed a new ensemble called Elysian Fields in collaboration with improvising musicians Matt McMahon (piano), and Matt Keegan (saxophones). The band is based on friendships. Matt McMahon and I got to know each other chatting about music at jazz gigs, mostly between sets of the various bands Matt appears with. Matt Keegan I met when I first taught him in high school. We lost touch while he grew up, and I had a family, but we gradually reconnected. When I told him about my electric viola da gamba idea he was incredibly supportive. We were soon joined by a rhythm section of recent Sydney Conservatorium graduates: drummer, Finn Ryan and bass guitarist, Siebe Pogson. Matt Keegan strongly recommended having talented younger people in the band for their energy, ideas and to 'give them a go'. He was right. Gifted vocalist/violinist Susie Bishop - who I have worked with before in a range of contexts - rounds out the group. Now we were a band but what did that mean? What was our reason for being? What would our aesthetic be? Would we play pseudo baroque, pseudo jazz or some other melange? We were heading down an untravelled road guided by a leader whose chief claim to fame was her expertise in the court music of King Louis XIV. The first challenge was creating a repertoire for a lineup which does not exist anywhere else: voice/violin, saxophones, electric viola da gamba, piano, bass guitar and drums. But there were complications. It was no use pretending I had jazz chops, nor did I have a decade or two to learn to improvise at the level of the rest of the band. I was never going to be a muso who could walk into a bar in New York and play any jazz standard in any key. I was also coming to grips with the realities of my new instrument. The Ruby electric viola da gamba, which was made for me in Holland, is a 'stick', similar to an electric upright bass. I played it standing rather than sitting down (as for the acoustic viola da gamba). 'Gamba' means leg in Italian and the term viola da gamba refers to the fact we traditionally hold the instrument between our legs, literally resting it on our calves. Standing up was a big deal. Finally, there were technical matters that required mastery on my part: basics like how to set up an amp, plug into a PA, work with effects pedals, adjust the volume and get the tone I wanted electronically rather than acoustically. Taken individually, these are minor bumps along the untravelled road, but collectively they represented serious potential blockages. Creating new repertoire is the challenge I believe we've all enjoyed the most. After years of largely playing works by dead Baroque-era men - although I had commissioned some new Australian music (see the video, on Youtube, of Times Past by Paul Cutlan). I was now in the thick of contemporary compositional processes. I asked Matt Keegan to write for us and he came back with Elysium, a 16-18-minute work for voice and ensemble which bowled me over. It was superbly constructed for my instrument, largely notated but with some improvised sections. Often, I was playing in a duet with the vocalist, something I have deep experience of from playing continuo in baroque music. World premiere of Elysium by Matt Keegan. Matt McMahon had already written two original works for electric viola da gamba and piano which he re-scored for the band. Bassist Siebe Pogson is a skilled composer/arranger and had produced a duet, called Dark Dreaming for electric bass and electric gamba, which he also rewrote for the new ensemble (see: Rescue by Siebe Pogson on Youtube). Then came another personal challenge: if Elysian Fields was going to focus on music written or arranged by band members, I needed to compose too, something I had largely ceased doing in my early 20s. Like many classical musicians, I had given up composing because I thought I was not good enough. I hibernated for two weeks at a relative's house in the country, fired up my Sibelius software and sketched a chart of my own, influenced by the French baroque sound world of Marin Marais. It still took quite a deal of time after that for me to come up with the finished article. It is hard to describe our style as it is still evolving: perhaps jazz meets chamber music meets world music with a focus on clarity of textures and the interplay between instruments and voice. Matt Keegan, Matt McMahon and Siebe Pogson are apt at writing to my strengths and those of the electric viola da gamba. They have also been kind enough not to allocate me lots of 32-bar solos in awkward keys. This has allowed me to gain confidence and find my voice, a process that is continuing. 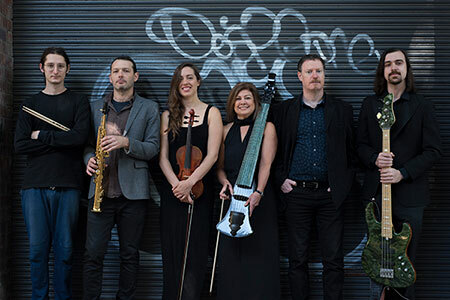 Just by setting off down the road and forming this ensemble we have called into being a whole new Australian repertoire for an ancient instrument that traces its European history back to the 1400s. We got our first gig at Foundry616 in 2015, having never played together, anywhere. My thanks go to Foundry616 owner, Peter Rechniewski, for believing in an idea... and for not asking for proof of concept! We kept playing and writing. Last year, Matt McMahon composed a gorgeous song cycle called What should I say that set four poems by Thomas Wyatt, a courtier to King Henry VIII (see: world premiere performance on Youtube). Henry was a man who knew what a viola da gamba was even if he had a deservedly bad reputation with women. 2017 proved to be our breakthrough. In January we performed alongside my acoustic viola da gamba band, the Marais Project, in the first event in Australia at which acoustic and electric viola da gamba ensembles appeared on the same program. In May we were guest artists at the Vivid New Music at the Con series curated by Damien Ricketson. In September, partly supported by a crowdfunding campaign, we took to the studio to record our first CD. In November 2017, we performed at the Sydney International Women's Jazz Festival. The momentum continued into 2018 with the launch of our latest venture, the Scandinavian Project. I have Swedish heritage via my grandfather and previously released a CD of Swedish baroque, folk and jazz with the Marais Project. Siebe Pogson and Matt Keegan wrote major new works for this venture inspired by the Nordic World, while Matt McMahon, Susie Bishop and I arranged Swedish and Norwegian folk and jazz charts (see Youtube for an example). In September we will release our first CD, largely consisting of original Australian music. Are we ever too old to follow our dreams? I hope not. I am closer to 60 than 40 now, so let's just assume none of us is ever too old to start something new. My lifelong idol, the great Catalan viola da gambist Jordi Savall, is still touring, aged 75+. I met him again in Sydney earlier this year, and he is full of life and energy. We did not have a plan for Elysian Fields, but we did have a goal: to make good music amongst friends while pushing ourselves outside our respective comfort zones. Just by pursuing that goal we've found ourselves quite a way down the untravelled road. Who knows what comes after the next bend. Jenny Eriksson is one of Australia’s best-known viola da gambists. She has appeared as a soloist and continuo player across Australia and performed in New Zealand, Singapore, New Caledonia, Germany, Holland and Sweden, and held a residency at the Banff Centre for Arts and Creativity in Canada. She founded the Marais Project in 2000 and has released six CDs of new and old music for the acoustic viola da gamba. She also directs Da Vinci’s Apprentice, which commenced touring schools in 2018 for Musica Viva in Schools, presenting an original music theatre piece with music by Sally Greenaway. She co-founded Elysian Fields with Matt Keegan and Matt McMahon in 2015. The electric bass viola da gamba sounds like a fantastic instrument! I fondly remember writing a piece some 20 years ago involving Jenni for The Renaissance Players that deployed 3 bass gambas. All of them had different scordature and were required to produce natural harmonics from time to time. Best wishes with the new instrument and group!